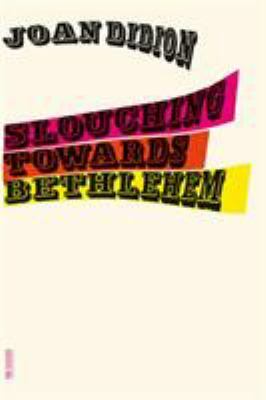 Upon its publication in 1968, Slouching Towards Bethlehem confirmed Joan Didion as one of the most prominent writers on the literary scene. Her unblinking vision and deadpan tone have influenced subsequent generations of reporters and essayists, changing our expectations of style, voice, and the artistic possibilities of nonfiction. "In her portraits of people," "The New York Times Book Review wrote, "Didion is not out to expose but to understand, and she shows us actors and millionaires, doomed brides and naive acid-trippers, left-wing ideologues and snobs of the Hawaiian aristocracy in a way that makes them neither villainous nor glamorous, but alive and botched and often mournfully beautiful. . . . A rare display of some of the best prose written today in this country." In essay after essay, Didion captures the dislocation of the 1960s, the disorientation of a country shredding itself apart with social change. Her essays not only describe the subject at hand--the murderous housewife, the little girl trailing the rock group, the millionaire bunkered in his mansion--but also offer a broader vision of America, one that is both terrifying and tender, ominous and uniquely her own. Joyce Carol Oates has written, "Joan Didion is one of the very few writers of our time who approaches her terrible subject with absolute seriousness, with fear and humility and awe. Her powerful irony is often sorrowful rather than clever. . . . She has been an articulate witness to the most stubborn and intractable truths of our time, a memorable voice, partly eulogistic, partly despairing; always in control." Used Good (1 available) Ships from CA-Please note: **Tracking info updates only when package is accepted by USPS and once package arrives at your regional USPS processing center. ** Please allow 7-14 business days for package to be delivered. ITEM CONDITION: Cover/casing shows wear which may include scuffs on edges, dust jacket/cover curling, nicks, small taped tears, blemishes, tanning, price clipping, remainder marks, and/or creases. Text pages may have markings on them consisting of, but not limited to: previous owners name/gift inscription written on inside cover page, notations, underlining, and/or hi-lighting. Thank you for choosing Viva Books! VIVA BOOKS, INC.